I am new with pycom and pysense. I could run the Pysense and take measure with integrate sensors. That's great. Now, I wish to use my own moisture capcitive sensor and later to use a WatherMark sensor and I need analogic pin. I wonder if the External IO pin of the Pysense can help? For my future experience I would need 3 Analog input to read the measure and to Digial output to power the Watermark sensor. In that doc link text, it state that the IO1, IO4 & IO5 are connected to PIC. What it is really a PIC? The best is to be able to make my future experience with the Pysense, otherwise, I will investigate to connect the Poly4 to an Raspberry Zero W (without Pysense) and investigate how to use 3 Watermark sensor, on tempearture sensor (soil temperature) and on capacitive moisture sensor. Many thank for your help, tips and hints. Sensors must be powered individually, and the ground must be isolated from sensor to sensor. Even if powered individually, an open ground path to another un-powered sensor can't be allowed. This is best accomplished using multiplexers to open and close the appropriate channels. I’m afraid Seb has left Pycom but I’ll answer. Soldering a header to the side could work but not very mechanically stable. If it breaks it may take some of the pads. But would it possible or recommended to solder header on the side of the LoPy? I am on a good way, but I postponed that project due to other emergency tasks. I planned to be back with Pycom in a couple of weeks. I will update you. @pierrot10,could you make it work? I am doing something similar but I am confused about which pins I have to use. But does P14 (Switch) and P16 (VBAT) P19 (RTS) and P20 (CTS) can be used as ADC as well, as they look like reserved for VBAT, RTS, CTS, etc...)? I supposed I do not need a converted Analog to Digital? Can I directly connect my Analog input? WMx are the moisture sensor. P18 can be reserved for a 4 sensors. IF all is correct, I will have another problem, because I would need (not sure) two more Analog measure. Then can P19 and P20 be used? What will be the impact on RTC and CTS? P16 confused me because , its states 'VBAT'. What does it meens? It's a VBAT output? P14 could be the output the measure when the button is pressed? Or, can I use as Digital Input for Rain gauge (magnetic switch)? On Pycom tboards there are two I2C hardware peripherals that can be used (+ 1 bit-banged software driver). So You don't need to solder wires, just use the other I2C bus, the "1" one and use two of the GPIO pins that are available in connector of the PySense. As for the libraries there are a many examples or libraries in Python for several of I2C ADC, or can be derived, for example, from Arduino libraries. time.sleep() is as a delay without saving battery energy? That's correct, this is just for waiting a period of time not actually putting the CPU into sleep mode. If you are using a LoPy, SiPy or WiPy 2.0 you will require a deepsleep shield or pysense/pytrack in order to use deep sleep properly (The voltage regulator on these devices does not go into low power mode, and therefore uses lots of power in deep sleep mode, the extra boards fix this by removing power from the module). For all other pycom modules the deepsleep function works correctly and no external hardware is required. One thing to note when performing deepsleep, upon waking up the device does not continue from where it left off, it restarts just as if you pressed the reset button. The sensors are connected via I2C on SDA=P22 and SCL=P21. You can connect more I2C devices to this. You build a PCB which you place between the development and the expansion board (like the deepsleep board). I meant the form factor of the board, not the deep sleep board itself. Sorry to wrote that not clear. @pierrot10 Just to be clear, you don’t need the deep sleep shield with the LoPy 4, and you can achieve the same power consumption levels with machine.deepsleep. time.sleep() is as a delay without saving battery energy? or is efficient as the deepsleep bpard. it can't be so efficient as deepsleep. You have still cpu running, your program is still in memory and memory is power up. Deepsleep disable many hardware and you start fresh near like the reset press. Can I use Pysense, Lopy4 and deppsleep board all together? @seb, may ask you two last thing :o). On the Pysense board, which are the pin I can not use. Which are the pin used by the sensors and other tasks that I can not use for my own additonal needs? And can we order the pysens board without headers? In that way, I would be able to add my new board, below the pysense board. Maybe future pysense will have more rooms. something what was proposed to expansion board changes? @seb can you bring light to this headers? And if possible future plans for expansion boards changes like pysense, pytrack and normal expansion board? @pierrot10 said in [[Pysense] I can only solder wire on the bottom, which is not really clean. This depends on your soldering skills ;) The external header is not a plug in as well. IMHO you have two possiblilities for a cleaner look. Solder the wires to a connector and not directly to your sensor. You build a PCB which you place between the development and the expansion board (like the deepsleep board). On the PCB you can place plugs for all sensors. But this will add more height to your project. Version 2 may look a little more professional and will be better for mass production, but 1 will be better, because you can use heavy duty connectors. That would a very neat solution to the problem, I like it. We have not open source the design of our modules or shields. The only products with available schematics are the deep sleep shield and the two oem reference boards. 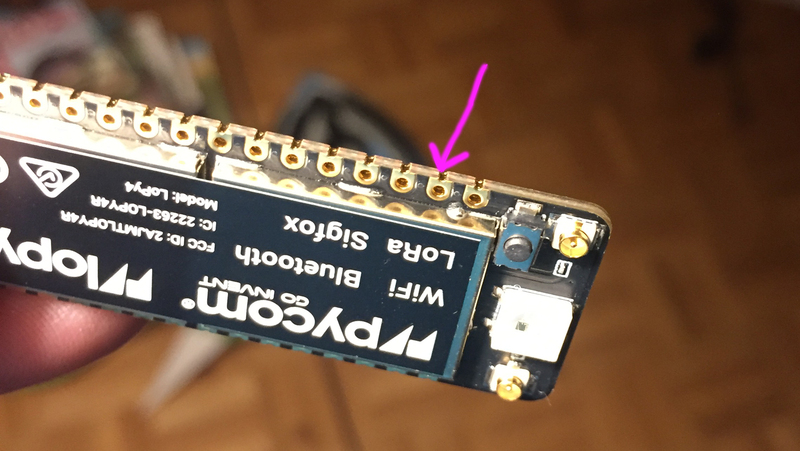 With the way the pysense/pytrack boards are design the only way to access the adc pins (P13, P14, P15, P16, P17, P18, P19 and P20) is by soldering to the bottom of the female headers. If you used an expansion board you would be able to access these pins easier but like you would no longer have the sensors. You could solder the pysense and expansion board together using the external io pins (just connect power and the sensors are all on i2c which is exposed on EXT_IO2 and EXT_IO3) but that is also not a very neat solution. @seb Dear Seb, thank again for your reply. It's a bit anooying because four of my additonnal sensor (Watermark and another capacitive mosture) need Analog input. I also plan to add a rain sensor (I am not informed about I2C or Analog)). So, if I wanto to use the PYsense sensor additonal of my extra needs, I can only solder wire on the bottom, which is not really clean. Is the Psysens schematic is opensource? I could modify it ad add extra pin to the Lopy4 Analog pin a create a PCB that I could share? Or , the extention boars is the only way to have analog input? In that case I would have to create a separeted PCB with the Pysens sensors and connect it to the Extension board. Is there a open source shematic for the Pysense sensors only?